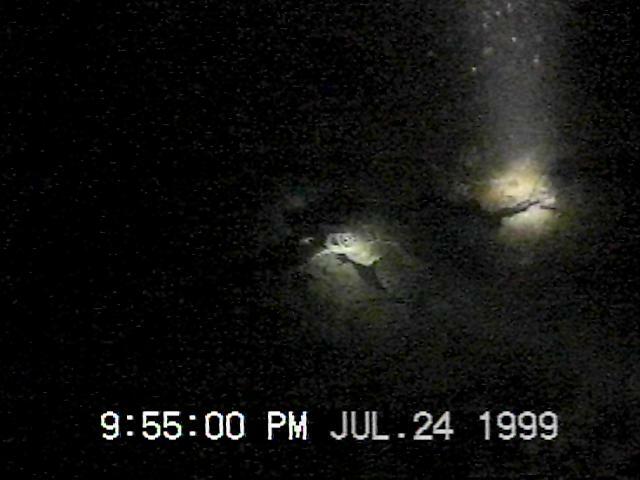 This summer we have explored both up and downcurrent and have probably tripled the area we now call our dive site. Like all explorers, we give new "regions" names--like The Bowl, NorthHouse, and Hale Manu (House of the Bird)--and like all explorers we've discovered some wonderful new sights. Also, to better understand this honu foraging ground, we needed to determine whether these turtles sleep in their daytime rest areas. We've realized for an uncomfortable time now that we only have an idea of what honu do from 7:30 am to sunset. Do these animals sleep in their daytime resting spots? A night dive was in order. A full moon lit the way. We decided to head out to Reef 2 and see if this marvellous honu rest site was also where the turtles slept. We kicked out to the Cavern and saw Polzbarney under his ledge. Polzbarney looked uneasy, even afraid. We shone lights on him only a few seconds, just long enough to videotape his presence. (Yes, that's really a turtle in the murk.) We continued deeper to Reef 2. We shone lights on him only a few seconds, just long enough to videotape his presence. The water was calm, clear, and the moon shone brightly that we could see easily, even without the lights. There were no honu in the Tramples (the name we've given to the resting spots favoured by the honu). When we turned out the lights, we discovered that we could actually see farther and better. We could not, however, see honu anywhere. None swimming up for air, none coming down. No honu anywhere. Back on shore, we realized that we hadn't proven much of anything. Perhaps like us, honu take advantage of a full moon, and that's why we didn't see them in their resting places. Perhaps they were all out foraging. It didn't take long to conclude that all we proved was that the honu weren't in their "berths" for the half hour we showed up that night. So where they are and what they do under a starry Hawaiian night is still a mystery. It was a late afternoon dive the day after our night dive. We came upon Makana's Ridge and saw a Black Tip reef shark "playing" with Makana. Makana, a honu about 50 cm. in length, was swimming in a slow circle while the shark followed in the "dance." At first we thought the shark was trying to eat Makana, only the little turtle didn't look all that concerned. Also, about two metres away, an even smaller Akebono looked on with total disinterest from under her ledge. When the shark noticed us, it took off, and Makana came to rest atop some corals. Ursula swam over the ridge trying to follow the shark, and almost collided with a hawksbill! This turtle had its head thrust into coral crevices. Ursula swam over the ridge trying to follow the shark, and almost collided with a hawksbill! Imagine. Makana resting a few metres away, Akebono in her ledge underneath, and this hawksbill--all occupying the same small patch of reef at once. The hawksbill also couldn't care less about our presence. 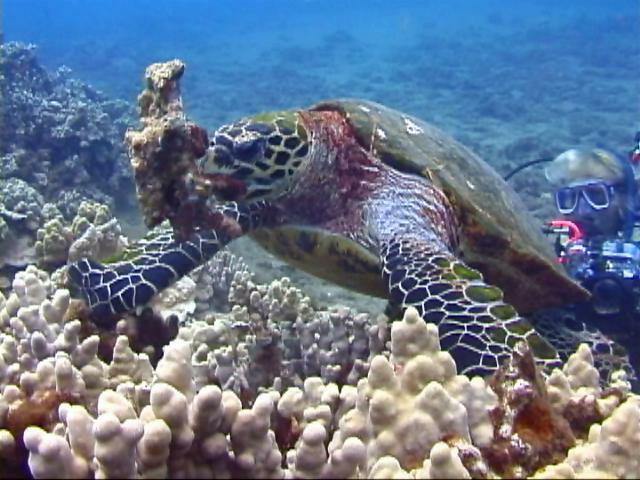 It continued feeding, digging his head into the corals, convinced there was a tastie there. Turned out he was right. The shark. The hawksbill. A whole bunch of new turtles showing in the last few days. Maybe it's the full moon... but the full moon has another effect. It brings with it a current so strong it turns Honokowai into a river! Knees hurt. Elbows (we have to carry cameras and hold them when taking pictures) ache. If only we were remotely streamlined! We saw a shark. Yes, a hawksbill is a rare sight to see. Exploring new territory is both exciting and rewarding. Yet we never forget why we are here. 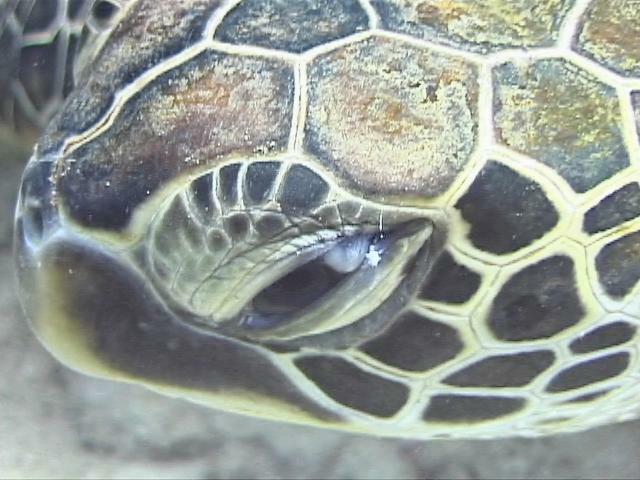 We continue to document fibropapilloma disease in this community of sea turtles. 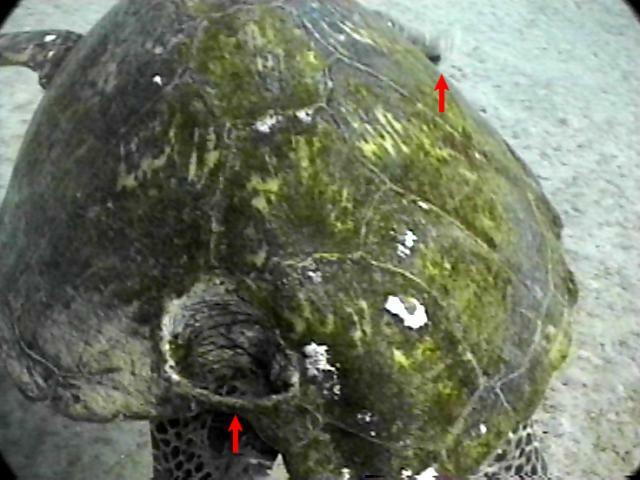 Here is a haunting image from this week: a turtle with its right front flipper "amputated", a large hole in the rear of its carapace, and on top of all this, the poor creature has FP tumors. Here is a haunting image from this week. Finally and sadly, the young honu we met for the first time last year is now showing early signs of tumors in both her eyes. Makana is now FP's littlest victim. The young honu we met for the first time last year is now showing early signs of tumors in both her eyes.